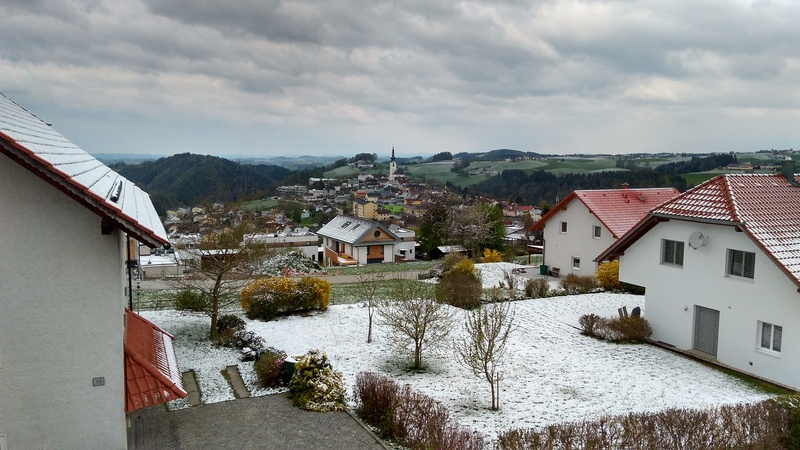 … could have made working in Austria very dull. 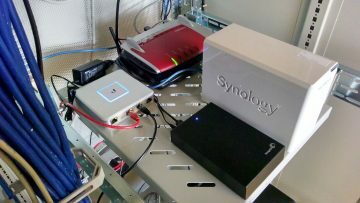 The installation that I did there in Linz became the first location in which all of the networking gear comes from the UniFi line of products from Ubiquiti Networks. The software in this inexpensive equipment makes it easy to us to monitor and manage it all from one central location. That feature takes a burden off of both local staff and those of us who support them. It’s working great, and everyone is quite satisfied with the improvements. 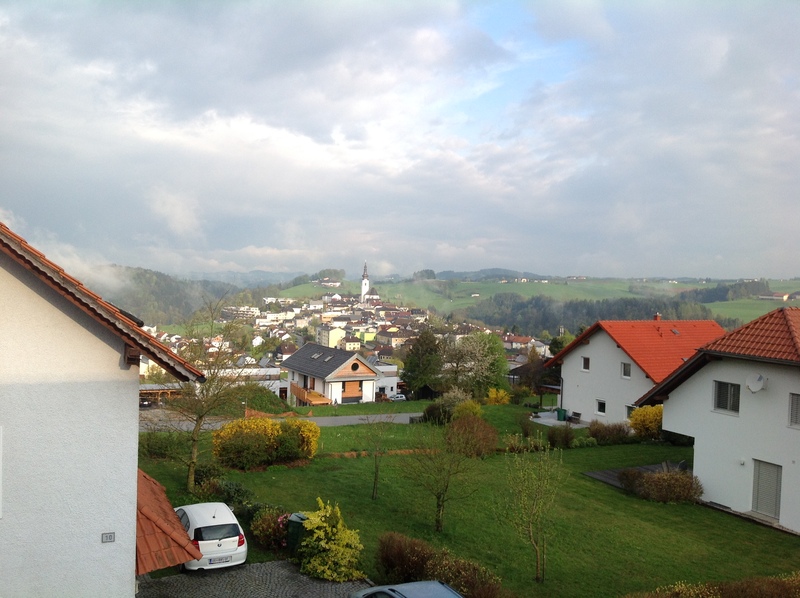 With that day of productivity done, Katherine, the boys, and I could enjoy the remainder of our time in Linz. 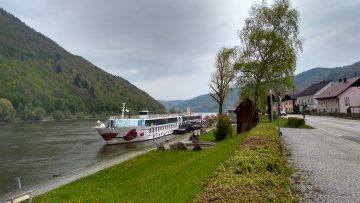 We visited a few museums, took a long bike ride along the Danube, and enjoyed the traditional afternoon coffee and cake. After our return home to Germany, our preparations for our furlough in the U.S. began to accelerate. In late June, we moved out of our apartment and over to the Wycliffe center. As I write this, we are five days away from our departure. Nearly everything that needs to be stored for the next year is in a cellar or attic location, and the last bits of sorting and packing are underway. In the U.S., we’ll take up residence in a townhouse in Lancaster, Pennsylvania, just minutes from my younger sister and her family. My mother is not much further away. Jonathan and Caleb will be attending Hempfield High School, which we’re all sure will be a vastly different experience from Dietrich Bonhoeffer Gymnasium and the German school system. The next year could be quite the adventure! … you just might get more of it. Winter must have read what I wrote recently and taken affront at the title. “Discontent? I’ll give you discontent!” The week before last, one crucial element of the network in Austria—a switch that I’m scheduled to replace next month— decided to quit outright. Anything that couldn’t connect over the wireless network was out of luck. Incoming VPN connections? Nope, sorry. 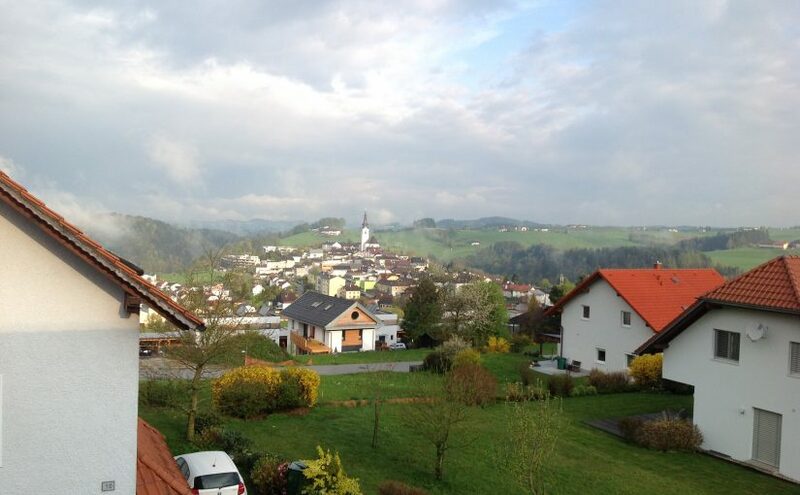 But let’s now give Sabine Oetzel, the director of Wycliffe Austria, a round of praise for her willingness to let some IT goon in Germany talk her through the process of re-routing cables so that essential hardware and services could be connected again. The week after Easter, Katherine, the boys, and I will take a working vacation to Linz so that I can install the new equipment. Maybe it was our planning another working vacation that triggered the next thing. (Or maybe it’s just a little bit fun being mock-superstitious.) The last time we made a trip like that, it was to go to Amsterdam to replace the Bomgar server that enables our IT staff and many other people provide remote support. 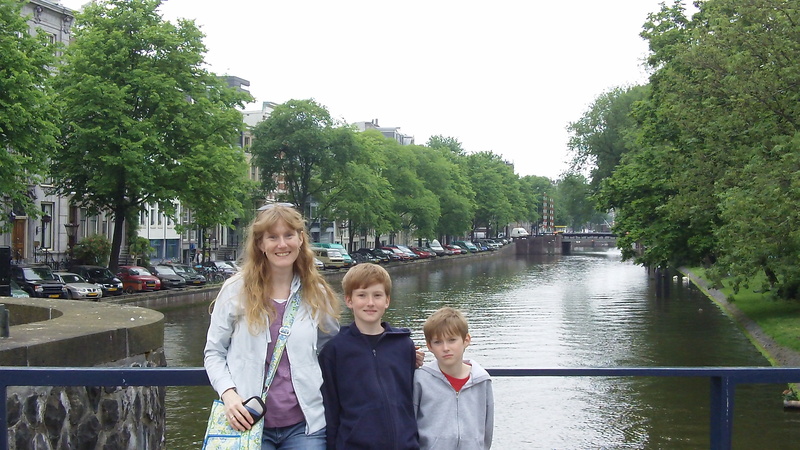 Amsterdam, May 2012: Objects in picture are now taller than they appear. So what happens this week? That replacement appliance decides to get finicky and stops working. With help from the people who run the data center, I managed to access it again and download fresh backups of settings and user accounts. The next day, it went down for good. Argh. Please pray with me that its replacement arrives in time to go with me to the Netherlands at the end of the month. I’ll be going up there anyway to provide support for a large conference. I promised that I would write more about our upcoming furlough. This summer, we will have been living and working here for nearly six years. Now it’s time for a break. In July, we will come back to the U.S. to spend one year away from Germany and with our family, friends, and supporters. Lord willing, we will return here in July 2018—but not to the exact same work situation. Over the course of our time here, I have realized a few things about myself. I have felt somewhat unfulfilled in the remote support work that I normally do. It’s not that the work is unnecessary or unworthy of attention—the stories I have related here make that point. What I realized over much time, thought, and prayer is that—despite being a ‘healthy’ introvert—I have a strong need to work with my clients face-to-face and shoulder-to-shoulder. When I have those faces in front of me every day, I perceive an added dimension to the service I provide and the satisfaction I receive from it. Remote work often feels empty to me. I approached my team leader, Martijn de Vries, with my dilemma. He approved an idea I had to approach Wycliffe Germany with the suggestion that I work exclusively (or primarily) for them. With the addition of the new Karimu conference center, they have the largest campus in Europe and the greatest need for on-site support. 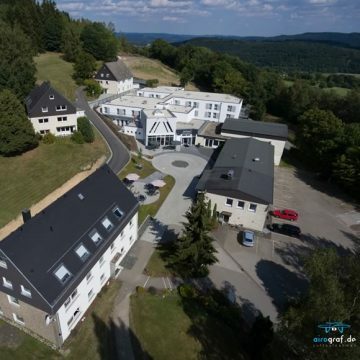 Wycliffe Germany does not have a staff member dedicated to technical matters, and that situation could easily threaten or reduce their ability to host effective meetings and conferences. So I went to them in October and said, “I see your need and would like to help.” In December, their leadership team replied that they would gladly have me there full-time. So we have a plan for our return: Katherine and I will each be spending our working hours with Wycliffe Germany and Karimu. Our plan for furlough is still developing, but a few things we know: we will be living in vicinity of Lancaster, PA, and we will be visiting the people who have been faithfully praying for us and supporting our ministry with Wycliffe. When you pray and think of us, please pray for successes in my trip to the Netherlands and our trip to Austria. Pray for wisdom and perseverance as we plan and sort and pack in the coming months. Finally, pray for a satisfying schedule of appointments with folks during our furlough … and for rest. Thank you! So far as our day-to-day work goes, not much changes. For the people we serve, that’s largely a good thing. The clients of my technical support and services want stability, reliability, and predictability. It’s when those qualities suddenly disappear that I receive a frantic message or phone call. In those cases, it helps to be able to think fast and perhaps even travel at short notice. Here are the highlights of the events that popped up over the past few months. In December, my colleagues at Wycliffe Netherlands called and reported that their Internet connection had quit. The other tenants of their building in Driebergen were fine—only their office was affected. Shortly after determining that they had a problem that they could not resolve themselves, I started the three-hour drive north. I took three devices that I could use in place of the one that failed. In the end, though, it was only a power adapter that was faulty—a relief to me and to them. I spent the night there, took care of some smaller matters in the office, and then drove home to Niederdresselndorf. 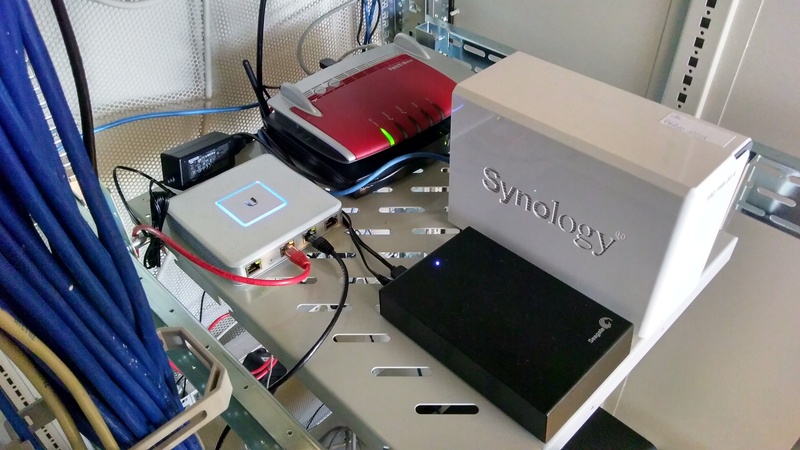 In January, the backup file server used at Wycliffe Switzerland died. That sounds worse that it really was. When we replace these servers, our practice is to use the older file server to do daily backups. USB backup drives are used less frequently for longer storage. When the Swiss backup server failed, I needed to reconfigure the data arrangement and backup schedule to give them an efficient arrangement. It’s been working to my satisfaction—and theirs—for a several weeks now. In time, they’ll replace the working file server, and it will become the backup. A few weeks ago, the director of Wycliffe Austria—who was attending a workshop here—consulted me on the matter of replacing aging equipment in her office in Linz. Since she claimed little familiarity with technology matters, I walked her through our own small office, pointed out the components of our network, and explained what role they play. She was grateful to have that overview and relieved to hear that new equipment would not cost nearly as much as she (and their board) might have feared. Katherine’s work in the library associated with Wycliffe Germany has been steady. New books come in, loans go out to people doing linguistic and translation research, and God’s message finds its way into yet another language. She has been busy lately introducing the routines of the library to the woman who will oversee the work after we return to the U.S. for a year’s furlough. (More on that later!) We hope to begin a project soon that will unfetter the library from a local database to one that will allow people to search for and request items online. If you’re praying for us, please pray for wisdom and patience in all that we do, especially when one system or another acts up.